Presenting the Solaris ZFS filesystem, as implemented in Linux FUSE, native kernel modules and the Antergos Linux installer. ZFS remains one of the most technically advanced and feature-complete filesystems since it appeared in October 2005. Code for Sun's original Zettabyte File System was released under the CDDL open-source license, and it has since become a standard component of FreeBSD and slowly migrated to various BSD brethren, while maintaining a strong hold over the descendants of OpenSolaris, including OpenIndiana and SmartOS. Oracle is the owner and custodian of ZFS, and it's in a peculiar position with respect to Linux filesystems. Btrfs, the main challenger to ZFS, began development at Oracle, where it is a core component of Oracle Linux, despite stability issues Red Hat's recent decision to deprecate Btrfs likely introduces compatibility and support challenges for Oracle's Linux road map. Oracle obviously has deep familiarity with the Linux filesystem landscape, having recently released "dedup" patches for XFS. ZFS is the only filesystem option that is stable, protects your data, is proven to survive in most hostile environments and has a lengthy usage history with well understood strengths and weaknesses. ZFS has been (mostly) kept out of Linux due to CDDL incompatibility with Linux's GPL license. It is the clear hope of the Linux community that Oracle will re-license ZFS in a form that can be included in Linux, and we should all gently cajole Oracle to do so. Obviously, a re-license of ZFS will have a clear impact on Btrfs and the rest of Linux, and we should work to understand Oracle's position as the holder of these tools. However, Oracle continues to gift large software projects for independent leadership. Incomplete examples of Oracle's largesse include OpenOffice and recently Java Enterprise Edition, so it is not inconceivable that Oracle's generosity may at some point extend additionally to ZFS. To further this conversation, I want to investigate the various versions of ZFS for Linux. Starting within an RPM-centric environment, I first describe how to install the minimally invasive FUSE implementation, then proceed with a native install of ZFS modules from source. Finally, leaving RPM behind, I proceed to the Antergos distribution that implements native ZFS as a supported installation option. ZFS is similar to other storage management approaches, but in some ways, it's radically different. ZFS does not normally use the Linux Logical Volume Manager (LVM) or disk partitions, and it's usually convenient to delete partitions and LVM structures prior to preparing media for a zpool. The zpool is the analog of the LVM. A zpool spans one or more storage devices, and members of a zpool may be of several various types. The basic storage elements are single devices, mirrors and raidz. All of these storage elements are called vdevs. Mirrored vdevs in a zpool present storage that's the size of the smallest physical drive. A mirrored vdev can be upgraded (that is, increased in size) by attaching larger drives to the mirrorset and "resilvering" (synchronizing the mirrors), then detaching the smaller drives from the set Resilvering a mirror will involve copying only used blocks to the target device—unused blocks are not touched, which can make resilvering much faster than hardware-maintained disk mirroring (which copies unused storage). ZFS also can maintain RAID devices, and unlike most storage controllers, it can do so without battery-backed cache (as long as the physical drives honor "write barriers"). ZFS can create a raidz vdev with multiple levels of redundancy, allowing the failure of up to three physical drives while maintaining array availability. Resilvering a raidz also involves only used blocks and can be much faster than a storage controller that copies all disk blocks during a RAID rebuild. A raidz vdev should normally compose 8–12 drives (larger raidz vdevs are not recommended). Note that the number of drives in a raidz cannot be expanded. ZFS greatly prefers to manage raw disks. RAID controllers should be configured to present the raw devices, never a hardware RAID array. ZFS is able to enforce storage integrity far better than any RAID controller, as it has intimate knowledge of the structure of the filesystem. All controllers should be configured to present "Just a Bunch Of Disks" (JBOD) for best results in ZFS. Data safety is an important design feature of ZFS. All blocks written in a zpool are aggressively checksummed to ensure the data's consistency and correctness. You can select the checksum algorithm from sha256, fletcher2 or fletcher4. You also can disable the checksum on user data, which is specifically never recommended (this setting might be useful on a scratch/tmp filesystem where speed is critical, while consistency and recovery are irrelevant; however, sync=disabled is the recommended setting for temporary filesystems in ZFS. You can change the checksum algorithm at any time, and new blocks will use the updated algorithm. A checksum is stored separately from the data block, with the parent block, in the hope that localized block damage can be detected. If a block is found to disagree with the parent's checksum, an alternate copy of the block is retrieved from either a mirror or raidz device, rewritten over the bad block, then the I/O is completed without incident. ZFS filesystems can use these techniques to "self-heal" and protect themselves from "bitrot" data changes on hard drive platters that are caused by controller errors, power loss/fluctuations in the read/write heads, and even the bombardment of cosmic rays. ZFS can implement "deduplication" by maintaining a searchable index of block checksums and their locations. If a new block to be written matches an existing block within the index, the existing block is used instead, and space is saved. In this way, multiple files may share content by maintaining single copies of common blocks, from which they will diverge if any of their content changes. The documentation states that a "dedup-capable checksum" must be set before dedup can be enabled, and sha256 is offered as an example—the checksum must be "collision-resistant" to identify a block uniquely to assure the safety of dedup. Be warned that memory requirements for ZFS expand drastically when deduplication is enabled, which quickly can overwhelm a system lacking sufficient resources. But, no matter how much searching you do, there is [sic] no ZFS recovery tools out there. You are welcome to call companies like Ontrack for data recovery. I know one person that did, and they spent $3k just to find out if their data was recoverable. Then they spent another $15k to get just 200GB of data back. There are no fsck or defrag tools for ZFS datasets. The boot process never will be delayed because a dataset was not cleanly unmounted. There is a "scrub" tool that will walk a dataset and verify the checksum of every used block on all vdevs, but the scrub takes place on mounted and active datasets. ZFS can recover very well from power losses or otherwise dirty dismounts. Fragmentation in ZFS is a larger question, and it appears related more to remaining storage capacity than rapid file growth and reduction. Performance of a heavily used dataset will begin to degrade when it is 50% full, and it will dramatically drop over 80% usage when ZFS begins to use "best-fit" rather than "first-fit" to store new blocks. Regaining performance after dropping below 50% usage can involve dropping and resilvering physical disks in the containing vdev until all of the dataset's blocks have migrated. Otherwise, the dataset should be completely unloaded and erased, then reloaded with content that does not exceed 50% usage (the zfs send and receive utilities are useful for this purpose). It is important to provide ample free disk space to datasets that will see heavy use. It is strongly encouraged to use ECC memory with ZFS. Error-correcting memory is advised as critical for the correct processing of checksums that maintain zpool consistency. Memory can be altered by system errors and cosmic rays—ECC memory can correct single-bit errors, and panic/halt the system when multi-bit errors are detected. ECC memory is normally found in servers, but becomes somewhat rare with desktops and laptops. Some warn of the "scrub of death" and describe actual lost data from non-ECC RAM. However, one of the creators of ZFS says that all filesystems are vulnerable when non-ECC memory is in use, and ZFS is actually more graceful in failure than most, and further describes undocumented settings that force ZFS to recompute checksums in memory repeatedly, which minimizes dangers from non-ECC RAM. A lengthy configuration guide addresses ZFS safety in a non-ECC environment with these undocumented settings (https://www.csparks.com/ZFS%20Without%20Tears.html), but the guide does not appear to cover the FUSE implementation. The Linux implementation of FUSE received a ZFS port in 2006. FUSE is an interface that allows a filesystem to be implemented by a process that runs in userspace. Fedora has maintained zfs-fuse as an RPM package for some time, but this package does not appear in any of the Red Hat-based distributions, including Oracle Linux. Red Hat appears to have intentionally omitted any relevant RPM for ZFS support. The FUSE implementation is likely the only way to (currently) use ZFS on Linux in a manner that is fully compliant with both the CDDL and the GPL. The FUSE port is relatively slow compared to a kernel ZFS implementation. FUSE is not generally installed in a manner that is compatible with NFS, so a zfs-fuse filesystem cannot be exported over the network without preparing a FUSE version with NFS support (NFSv4 might be available if an fsid= is supplied). The zfs-fuse implementation is likely reasonable for local, archival and potentially compressed datasets. Some have used Btrfs for ad-hoc compressed filesystems, and zfs-fuse is certainly an option for similar activity. Creating a zpool on non-redundant devices is informally known as "hating your data" and should be contemplated only for demonstration purposes. However, zpools on non-redundant media (for example, flash drives) have obvious data-consistency and compression advantages to VFAT, and the copies parameter can be adjusted for such a dataset to force all blocks to be recorded on the media multiple times (up to three) to increase recoverability. Mirrored drives can be created with zpool create vault mirror /dev/sdb /dev/sdc. Additional drives can be added as mirrors to an existing drive with zpool attach. A simple RAIDset can be created with zpool create vault raidz /dev/sdb /dev/sdc /dev/sdd. The mountpoint is retained and is persistent across reboots. This system is currently running ZFS pool version 23. At this point, you're are ready to proceed with a native ZFS installation. cannot import 'vault': pool was previously in use from another system. The pool can be imported, use 'zpool import -f' to import the pool. drwxr-xr-x. 2 root root      6 Sep 25 17:47 .
dr-xr-xr-x. 19 root root   4096 Sep 25 17:17 ..
Strong words of warning should accompany the use of native ZFS on a Red Hat-derivative. Kernel upgrades are a cause for concern. If the zfs.ko family of modules are not installed correctly, then no pools can be brought online. For this reason, it is far more imperative to retain known working kernels when upgraded kernels are installed. As I've noted previously, Oracle's UEK is not ZFS-capable when using the default native installation. OS release upgrades also introduce even more rigorous warnings. Before attempting an upgrade, remove all of the ZFS software. Upon upgrade completion, repeat the ZFS software installation using a yum repository that is specific for the new OS release. The ZFS on Linux site currently lists repositories for Red Hat releases 6, 7.3 and 7.4. It is wise to stay current on patches and releases, and strongly consider upgrading a 7.0 – 7.2 Red Hat-derivative where native ZFS installation is contemplated or desired. Note also that Solaris ZFS has encryption and Windows SMB capability—these are not functional in the Linux port. Perhaps someday Oracle will permit the Red Hat family to bundle native ZFS by relaxing the license terms. That will be a very good day. Definite legal ambiguity remains with ZFS. Although Ubuntu recently announced support for the zfs.ko module for its container subsystem, its legal analysis remains murky. Unsurprisingly, none of the major enterprise Linux distributions have been willing to bundle ZFS as a first-class supported filesystem. Into this void comes Antergos, a descendant of Arch Linux. 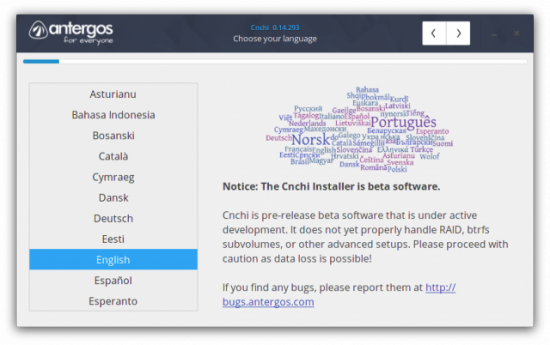 The Antergos installer will download and compile ZFS source code into the installation kernel in a manner similar to the previous section. Although the example installation detailed here did not proceed without incident, it did leave a working, mirrored zpool for the root filesystem running the same version release as the native RPM installs. What Antergos did not do was install the Linux kernel itself to both drives. A separate ext4 partition was configured for /boot on only one drive, because Grub2 does not support ZFS, and there appears to be a current lack of alternatives for booting Linux from a ZFS dataset. I had expected to see an installation similar to MirrorDisk/UX for HP-UX, where the firmware is configured with primary and alternate boot paths, and the OS is intelligent enough to manage identical copies of the boot and root filesystems on multiple drives. What I actually found was the root filesystem mirrored by ZFS, but the kernel in /boot is not, nor is the system bootable if the single ext4 /boot partition fails. 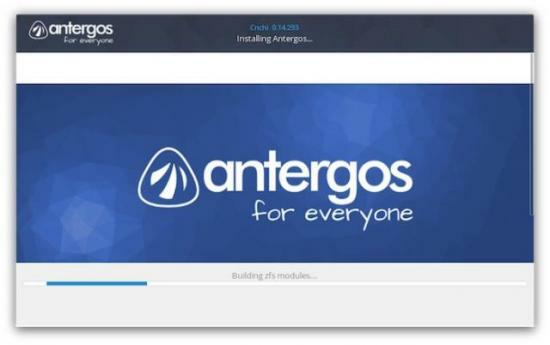 A fault-tolerant Antergos installation will require RAID hardware—ZFS is not sufficient. Note that the Antergos Minimal ISO does not support ZFS; it's only in the Live ISO. Internet access is required while the installer is running. The latest packages will be downloaded in the installer session, and very little is pulled from the ISO media. After booting your system on the live ISO, ensure that you are connected to the internet and activate the installer dialog. Note the warnings of beta software status—whether this refers to ZFS, Btrfs or other Linux RAID configurations is an open question. Select your territory or locale, time zone, keyboard layout (I suggest the "euro on 5"), and choose your desktop environment. After I chose GNOME, I also added Firefox and the SSH Service. Finally, a ZFS option is presented—enable it (Figure 2). As Figure 3 shows, I configured two SATA drives in a zpool mirror. I named the pool "root", which may have caused an error at first boot. Note also the 4k block size toggle—this is a performance-related setting that might be advisable for some configurations and usage patterns. The next pages prompt for the final confirmation before the selected drives are wiped, after which you will be prompted to create a default user. Note that /dev/sda2 has been mirrored to /dev/sdb, showing that Antergos has installed a zpool on an MBR partition. More important, these drives are not configured identically. This is not a true redundant mirror with the ability to boot from either drive. After fetching and installing the installation packages, Antergos will build zfs.ko. You can see the calls to gcc if you run the top command in a terminal window. ZFS: Unable to import pool root. cannot import 'root': pool was previously in use from another system. ERROR: Failed to mount the real root device. Bailing out, you are on your own. Good luck. The zpool import error above also was encountered when the FUSE pool was imported by the native driver. I ran the force import (zpool import -f root), which succeeded, then created a new dataset and copied the terminal to it, so you can the session here. After a Ctrl-Alt-Delete, the system booted normally. Naming the zpool "root" in the installer may have caused this problem. 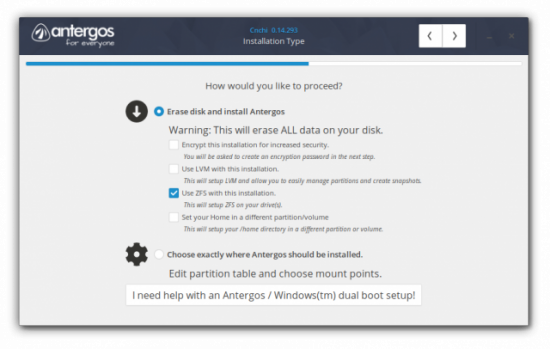 Antergos is not configuring a completely fault-tolerant drive mirror, and this is a known problem. The ext4 partition holding the kernel is a single point of failure, apparently required for GRUB. In the event of the loss of /boot, the Live ISO could be used to access the zpool, but restoring full system availability would require much more effort. The same likely will apply to raidz. ZFS is the filesystem that is "often imitated, never duplicated". The main contenders for ZFS functionality appear to be Btrfs, Apple APFS and Microsoft's ReFS. After many years of Btrfs development, it still lacks performance and maturity ("we are still refusing to support 'Automatic Defragmentation', 'In-band Deduplication' and higher RAID levels, because the quality of these options is not where it ought to be"). Apple very nearly bundled ZFS into OS X, but backed out and produced APFS instead Microsoft is also trying to create a next-generation filesystem named ReFS, but in doing so it is once again proving Henry Spencer's famous quote, "Those who do not understand Unix are condemned to reinvent it, poorly." ReFS will lack compression, deduplication and copy-on-write snapshots. All of us have critical data that we do not wish to lose. ZFS is the only filesystem option that is stable, protects our data, is proven to survive in most hostile environments and has a lengthy usage history with well understood strengths and weaknesses. Although many Linux administrators who need its features likely will load ZFS, the installation and maintenance tools have obvious shortcomings that can trap the unwary. It is time once again to rely on Oracle's largesse and ask them to open the ZFS filesystem fully to Linux for the benefit of the community. This will solve many problems, including Oracle's, and it will engender goodwill in the Linux community that, at least from a filesystem perspective, is sorely lacking. The views and opinions expressed in this article are those of the author and do not necessarily reflect those of Linux Journal. Charles Fisher has an electrical engineering degree from the University of Iowa and works as a systems and database administrator for a Fortune 500 mining and manufacturing corporation.